Garth The book is based on the actual experiences the author had while teaching others on how to use the permission slip.The book was purposely designed as a quick read. It was designed as a reference guide and a tool that can be used to mentor others efficiently and effectively. Garth Riley's background has included being an At Risk Youth Advisor, specializing in helping kids deal with bullies. He has taken his message about bullying to hundreds of schools across Canada. He is also a TV and radio host (Riley Live, The Riley Alternative, The Riley Perspective, and First Take Live), a corporate executive, business owner, presenter, mentor, and trains others in the areas of sales, media communication coaching, and public speaking. The Presentation is now a book. Here is what people had to say about the presentation. "This presentation provides each student with a framework of strength to stand up to bullies by establishing their own personal identity and confidence each day." 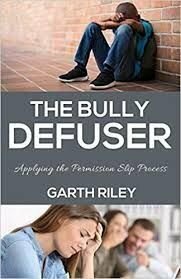 "The content and interactive delivery of the message are very effective and entertaining"
"Garth Riley captivates and engages students in mere moments... the students absorb and retain the message long after he has left the building"
"Garth delivers a powerful message. He shows empathy and the message is relevant." "The Permission Slip Workshops with our many classes were insightful and helpful." "I've used the permission slip with companies to get their sales results to grow." "Garth has brilliantly given us permission to reclaim our strength. The tools he provides are clear and concise and the results speaks loudly. Brilliant work."